There were 2 options; wade up the raging river or try and duck under the rickety looking scaffolding. We chose the latter. The last bars of the scaffolding were too high to step over and too low for me to comfortably duck under. I kept getting my day bag hooked on the rusty bars, rocks and stones fell from the over hanging cliff and the rain was incessant. I could feel I was going to get a lumbago at any moment and remembered how the guide book had described the Water Curtain Caves , Lahshao Si and the valley in which they were located as the embodiment of old China; serene and beautiful. At that moment it was a living hell. 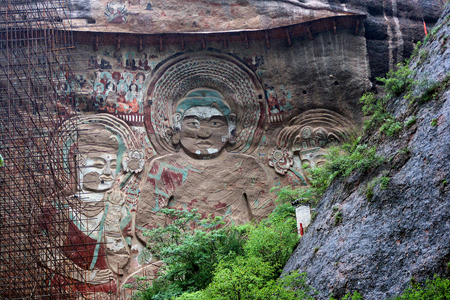 Another gem in Eastern Gansu, the Water Curtain Caves (Shuilian Dong) and Lashao Si 拉稍寺 take a bit of an effort to reach, especially if you are using public transport, but reward the intrepid with a valley of Taoist temples, rock carvings and paintings, without another tourist in sight. Unfortunately, for the next year, the path up the valley is being rebuilt and building work is everywhere somewhat spoiling the valley’s isolation. 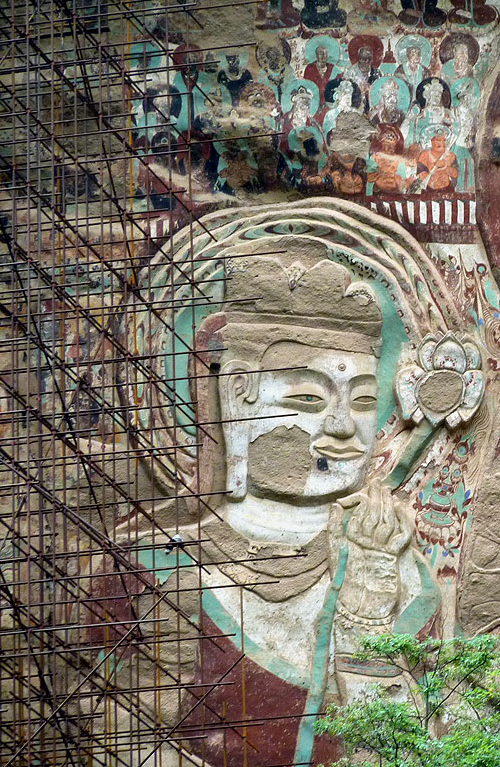 The huge carved Buddha and paintings overlooking the valley are under going restoration, but at least the scaffolding is being withdrawn and they can be seen quite clearly. However, many of the frescos are still covered. I’d recommend postponing any visit for at least a year. Some of the path up the valley is a death trap. At one point we had to clamber and crawl around some dodgy and hastily erected scaffolding that was holding up a cliff face as rocks fell all around us. Also try not to go when it’s raining as we did. The dry river bed becomes a raging torrent. 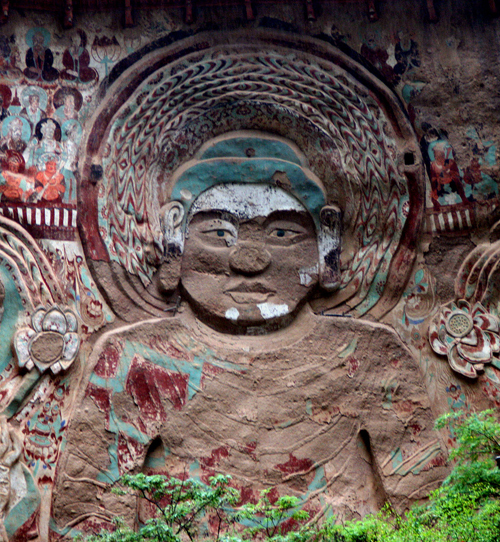 The images and frescoes were carved and painted during the Northern Wei dynasty (AD 386 – 534) and the colours are still fantastic. 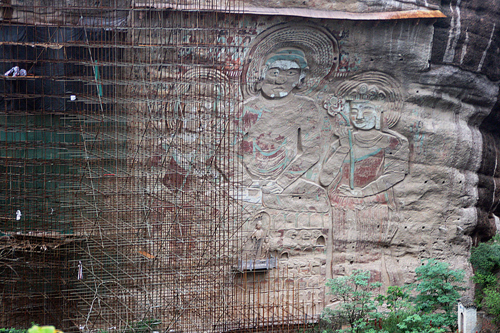 The object of the restoration work seems to be to try and build a shelf above the images in order to protect them from erosion and the elements. 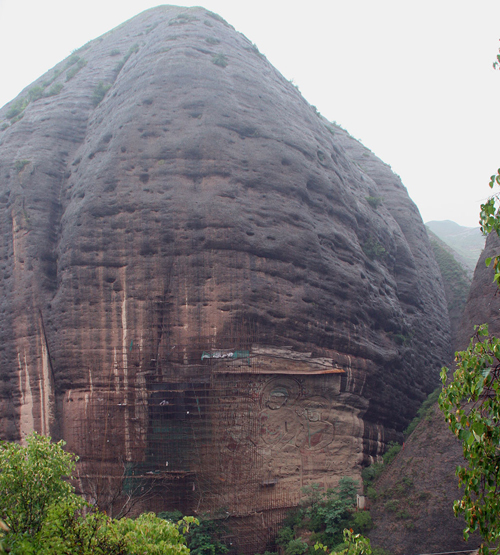 In order to get the best views of the paintings, climb up the path in the direction of the Taoist temple, Shuilian Dong. The surrounding scenery is spectacular with domed sandstone mountains rising up above the valley. We hired a taxi from Gangu station for the day (200 Yuan) and took in the Sakyamuni Statue on Daxiang Shan near Gangu as well ( see the previous posting for getting to Gangu). There are frequent buses between Gangu and Luomen from where you can also get private transport to the Water Curtain Caves. There are also buses from Lanzhou and Tianshui direct to Luomen. Whatever transport you take at the moment you’ll have to walk the final 3 kilometres to the carvings and temples. It would be a stunning walk if not for the building work. Eventually the new road will go right up to Lashao Si which will be a pity as the valley’s serenity will be lost. I enjoy your writing every time i visit your blog, do you work as a journalist some time? Keep up with the good blog. Actually the scaffolding work was just beginning when you arrived, and not being withdrawn. I visited in August last year and the paintings were completely covered by scaffolding. I don’t know if it’s been cleared now, or when it’s due to be cleared.